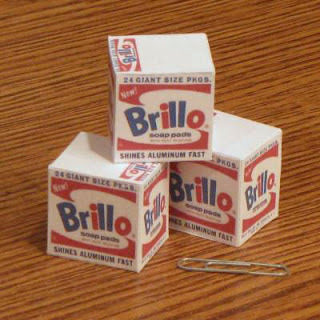 I don't know what came over me when I decided to create a mini papercraft version of Warhol's Brillo Boxes. It took quite a bit of work to accurately recreate the graphics on the boxes. Then there was the question of size. For lack of a better size, I decided to make them Barbie Doll scale (1:6). That way Barbie can be a... er... art museum curator or something. ;) The PDF template for the boxes is available here. Andy Warhol created his Brillo artwork in 1964 as a "deadpan replication of American commercial culture" (or so says the Allen Memorial Art Museum). Straight from the hilarious Ameristar Casino television commercials, it's a papercraft Quadricorn! 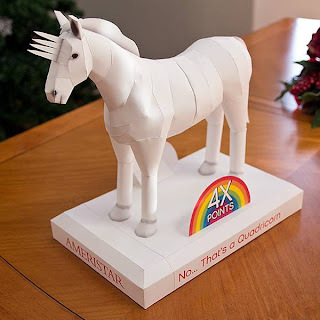 Ameristar commissioned well known papercraft designer Taras Lesko to create this Quadricorn paper model as a promotional item for the 2011 holiday season. A copy of the PDF template is available here. 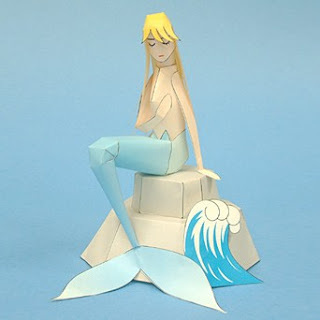 The Disney Family website continues to offer some fun papercraft projects. 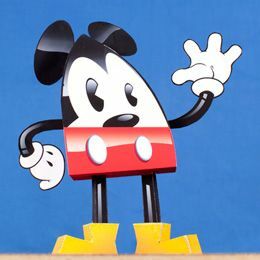 This teardrop Mickey Mouse is but one of dozens of free papercraft Disney characters available. The template for Mickey can be downloaded here. Rumor has it Thor's hammer has been restyled for the upcoming Avengers movie. 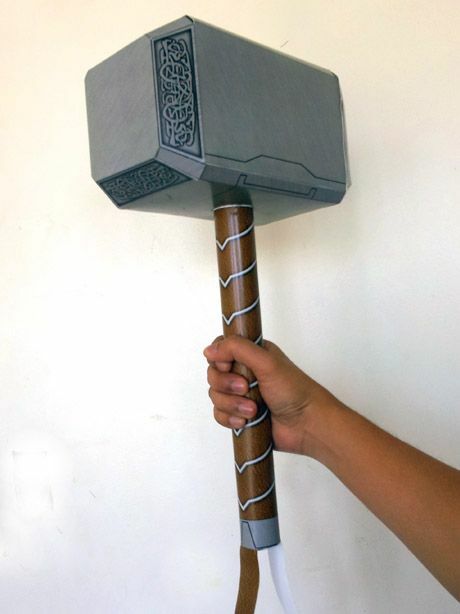 Just in time for the movie's opening, George Salire has modified his full scale Mjolnir papercraft to create an Avengers version of the hammer. The template for the Asgardian weapon may be downloaded here. Previous Mjolnir paper models posted on Tektonten Papercraft include: A half size comic book version, a full scale comic book version, and a full scale Thor movie version. I have fond memories of the Sonic the Hedgehog 2 video game. Sonic 2 was released in 1992 for the 16 bit Sega Genesis gaming console. It was the first game in the Sonic series to feature the character Tails. 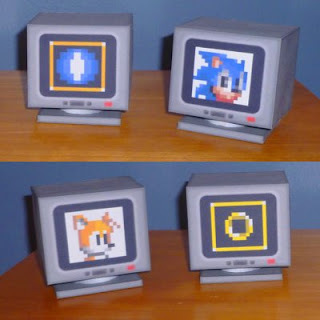 Power-ups in the game came in the form of video monitors. Billybob884 has created paper models of all 13 of the power-ups (a sample of which are shown above). Templates for the power-ups may be downloaded here and are available in both PDF and Pepakura PDO format. This wonderfully detailed papercraft catapult is the work of Polish modeler, Mariusz Grzywacz. The model which is at 1:125 scale is one of several free samples offered by the commercial paper model company, Renova. 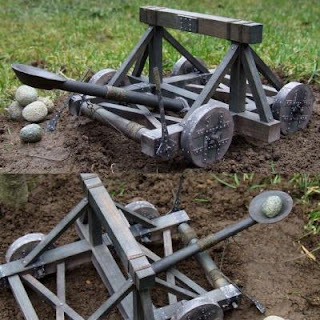 The PDF template for the catapult can be obtained here. Here's another full scale Lord of the Rings Papercraft from Movieman. This time it is an orc battle axe. 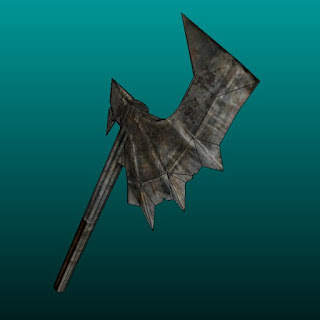 In the movie version of the Lord of the Rings, the goblins in the Mines of Moria wielded weapons styled like this one. The unlocked Pepakura PDO file for this model may be downloaded here. Here is yet another case of 2D papercraft being just as fun as 3D papercraft. 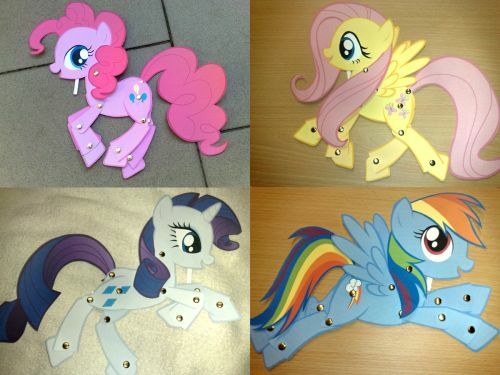 DeviantARTist Trunksi has created six different My Little Pony paper toys. Each toy is double-sided and poseable (including the eyes!) Pictured are Pinkie Pie, Fluttershy, Rainbow Dash, and Rarity. Also available are Applejack and Twilight Sparkle. Links to the printable templates for the ponies may be found here. 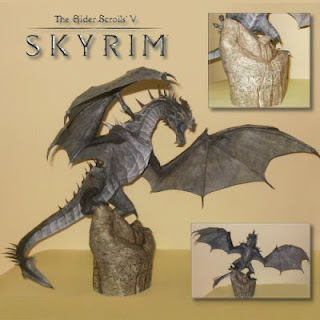 The detail level of this Skyrim frost dragon paper model is pretty impressive. DaiShiHUN, the creator of dragon, lists the build difficulty of the model as "very hard" (which is to be expected). The finished papercraft stands at 18"(46 cm) tall. A Pepakura PDO template for the model may be downloaded here. DaiShiHUN intended for this model to be the specific dragon, Viinturuth, who is one of several different named dragons that may be encountered in the video game. It won't be long until the Avengers movie is here! In the mean time, here are some printable kid-size Avengers masks offered by the Disney Family website. 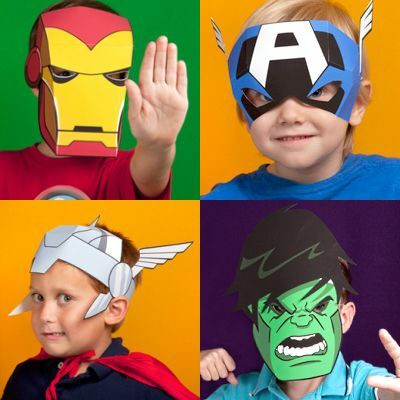 Current masks available include Iron Man, Captain America, Thor and the Incredible Hulk. Also to be found at the Disney site are coloring pages and an Avengers playset. The Little Mermaid in Hans Christian Anderson's version of the story gains human legs but feels excruciating pain each time she walks. Later, the prince she loves marries another and the little mermaid dies brokenhearted. Quite a bit different from Disney's version, eh? ;) This free papercraft by the Mochinuki Printing Company tries to capture some of the sorrrow of the original tale. The PDF template is available here. Graphic designer Tesha from Montreal is a self-proclaimed Kawaii Guru. Kawaii is a Japanese word which literally means "cute" or "adorable". 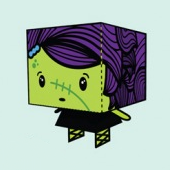 Tesha has several Kawaii paper toys available for download including a cat and a bear, but my favorite is this zombie. Check out all of Tesha's cute paper toys here. 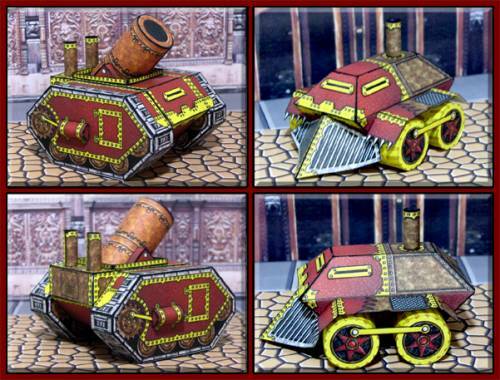 These Steampunk war machine paper models were created by Shaungamer88 for use in miniature gaming. On the left is the Groundhog mortar carrier with a 600mm gun. On the right is the Badger scout wagon which is used to infiltrate close to enemy lines. The PDF templates for the armored vehicles are contained in a single RAR file which may be downloaded here. Jerry Vondeling built and posted a photo of my Headpiece to the Staff of Ra papercraft back in 2010, but I only recently became aware of it. Nice work Jerry! 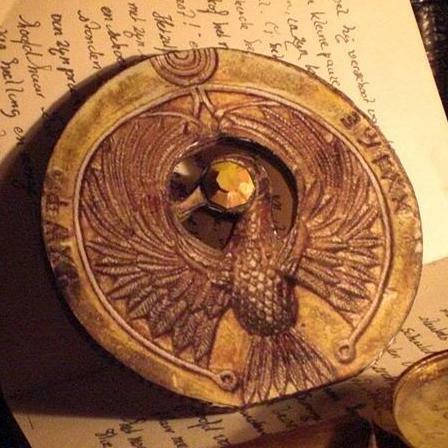 If you would like to build one yourself, the original post of the Headpiece may be found here. Another Indiana Jones papercraft I created is a full scale paper model of Indy's Webley revolver. The post for the revolver is located here. "Tibbers is a shadow bear, a ferocious denizen of the petrified forests in the Voodoo Lands... He was later tamed by Annie The Dark Child, turning him into her pet. To this day Tibbers remains by her side, spellbound as a stuffed doll to be carried like a child's toy." 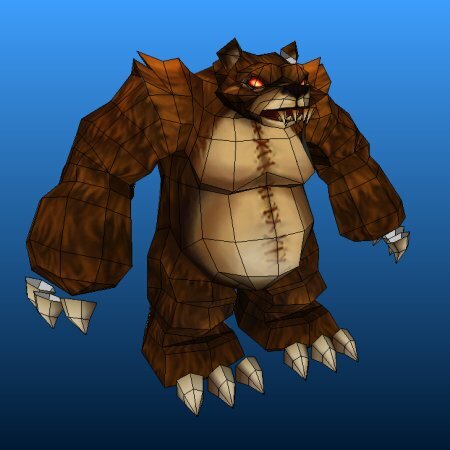 Portaldragon has put together both PDO and PDF templates for Tibbers. The templates may be downloaded here.